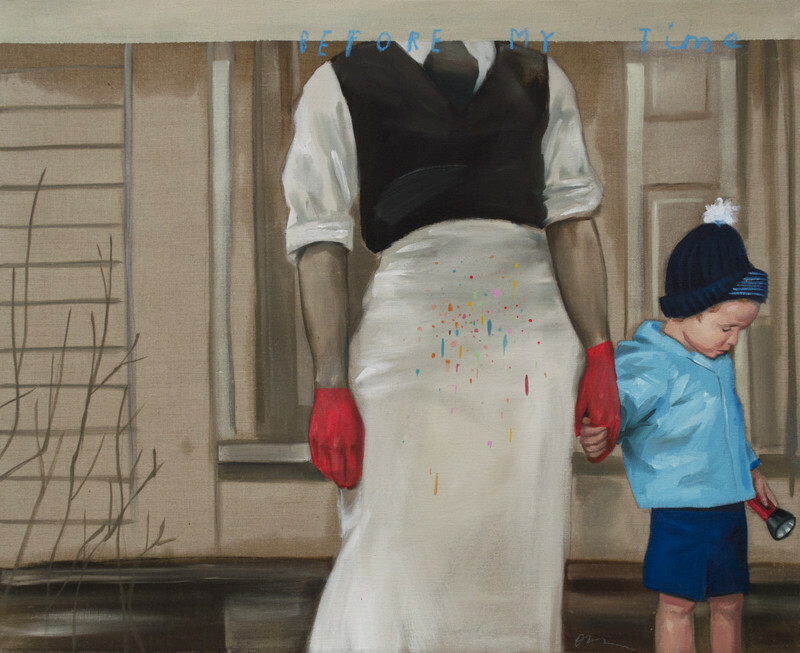 Before My Time By Oliver Jeffers. With a New York Times best-selling children’s book under his belt and more than a dozen other titles, Oliver Jeffers doesn’t stop at being incredibly successful at just one thing. He’s also a talented figurative painter and has installations and paintings exhibited across the world, including the National Portrait Gallery, Brooklyn Museum and Gestalten Space. You would think that these two practices are separate and distinct acts of making. But, Oliver views his books as an extension of his art, and his art as a way to satisfy his curiosity. He says that which outlet he chooses is dictated by the idea itself. 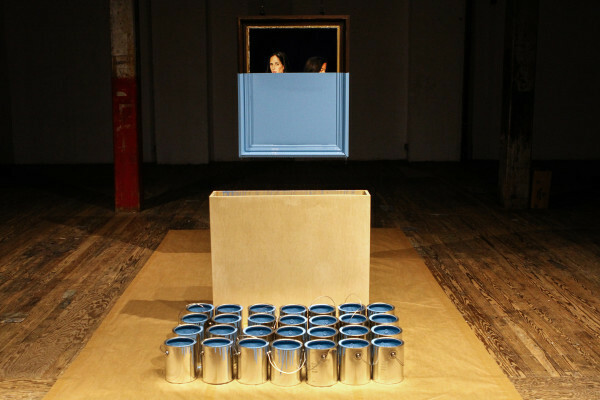 This versatility allows him to express complex ideas of memory, loss, and even quantum physics through both playful images, and at other times, highly orchestrated performances. See more of what we are talking about on Oliver’s Artwork Archive Public Page. 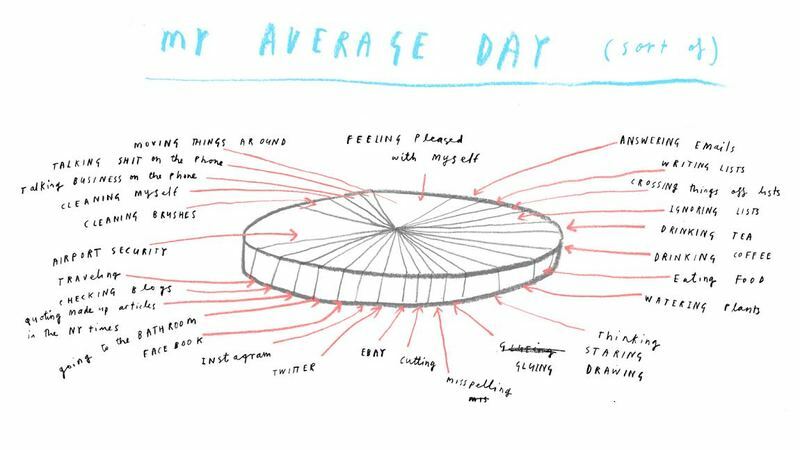 We got a chance to pick Oliver’s brain about what it’s like for him being a working artist today. LET’S START WITH SOME BASICS: WHAT DOES YOUR MORNING ROUTINE LOOK LIKE? DO YOU HAVE ANY STUDIO RITUALS? Every day starts with coffee and answering emails, but from there it all just depends on the project at hand. I tend to have several projects going at the same time, so my days tend to alternate between working on new picture book projects, working on new fine art projects, and finding time for little things. WHAT’S ON THE MOST CURRENT PAGE OF YOUR SKETCHBOOK? The most current page of my sketchbook has some preliminary sketches for new work in my Fathom Seascapes series, which I’m completing for an upcoming exhibition in New York this September. YOUR WORK HAS MANY CROSSOVERS BETWEEN SCIENCE AND ART ... HAS THIS ALWAYS BEEN SOMETHING THAT INTERESTED YOU? I’ve always been interested in science, though more from the same perspective of curiosity that informs much of my work. I first started formally introducing scientific elements to some of my work with my “Additional Information” series, which began in 2006 as a kind of collaborative project with a Belfast-based physicist named Hugh Morrison. 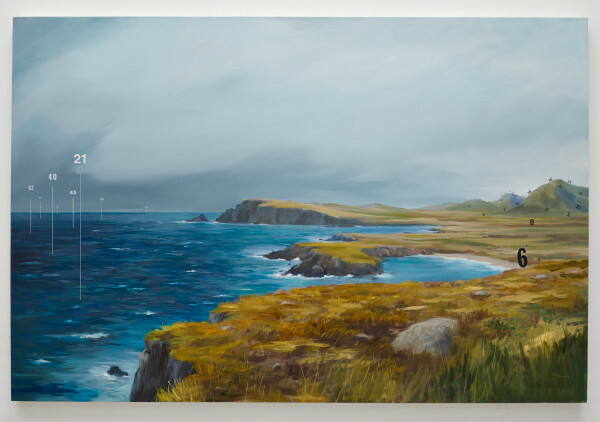 From there I’ve carried out a few more projects rooted in scientific inquiry (or at least informed by specific scientific principles), such as my Measuring Land and Sea and Dipped Paintings series. MANY ARTISTS EXPRESS FEARS AROUND BOTH MAKING AND SHOWING CREATIVE WORK. HOW HAVE YOU WORKED TO OVERCOME ANY FEARS THAT YOU HAVE? Early on in my picture book-making career I had moments of doubt about my ability to create work on the same level as many artists and writers that I admired, but I think this is something that pretty much all artists experience to one degree or another. As I pushed on with making new work it became easier to approach new projects with confidence. Ultimately, if we don’t make work that satisfies ourselves, it is unlikely to satisfy anyone else. I’ve used that as a little justification to stop caring about what other people think. YOU HAVE HAD GREAT SUCCESS IN MULTIPLE CREATIVE FIELDS. HOW DO YOU MANAGE TO WORK BETWEEN THEM? Most of the projects that I tackle (in both the fine art and publishing worlds) are first and foremost idea-based, and more often than not those ideas dictate the medium. I’m also always happy to develop new skills and techniques, so I tend not to be afraid to try out new materials. I think that there are also certain stylistic and visual motifs that appear throughout just about all of my work, so I still feel like all of my work is cohesive, regardless of the medium or audience. IF YOU HAD TO CREATE A PIE CHART OF HOW YOU SPEND YOUR TIME, HOW WOULD IT BE DIVIDED? As luck would have it, I have already created such a pie chart. WHAT DO YOU ENJOY MOST ABOUT CREATING WORK FOR YOUR LIVING? AND WHAT DO YOU FIND YOURSELF PUTTING OFF UNTIL THE VERY LAST MINUTE? The thing that I enjoy the most is the sort of “eureka moment” that you can experience when you finally land on that missing emotive element in a work. The Belgian painter Michaël Borremans describes finding satisfaction with his work as when it can cut like a “knife in the eye” — I quite like this as a description of the point at which a painting can “move” you. As for what I find myself putting off, unfortunately it tends to be answering interview questions. IN YOUR FIRST ATTEMPTS AT GETTING PUBLISHED, YOU INCLUDED A SELF ADDRESSED, STAMPED ENVELOPE FOR PUBLISHERS TO GET BACK WITH YOU AS EASY AS POSSIBLE … DO YOU HAVE ANY OTHER TIPS FOR THOSE JUST STARTING OUT? As for why Oliver and his team use Artwork Archive? I’d say it is useful for a number of reasons. We use the software to keep track of contacts and sales, but it also comes in handy as a quick and easy point of reference for basic information about the work, like dimensions or creation date. The software also makes it very easy for us to generate tailored PDFs and documents for clients and collectors. 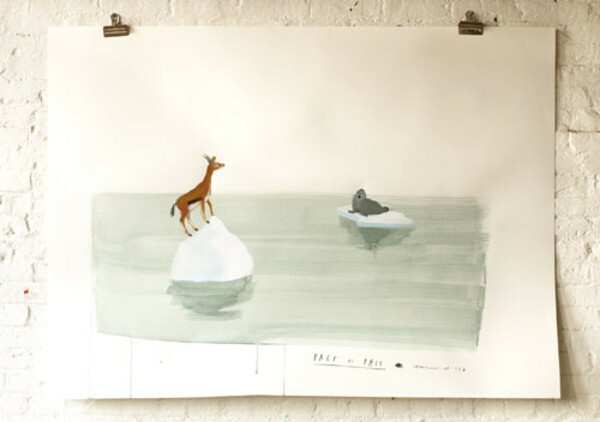 Want to try out the same system for how Oliver Jeffer’s studio manages his inventory? You can! Test is out free for thirty days!